I have been using this conditioner for a couple years now. I really like it. It can be used while grooming on the entire body, mane and tail. It helps twmove dust while grooming but does not make the coat too slick or attract dirt. It had a really nice fragrance. The added bonus is that it is half the price of similar products. Excellent product! Have used for several years. Good conditioner, helps easily detangle mane and tail and leaves a nice sheen for the show arena. I also use Cowboy Magic, but prefer this product while showing because it's a spray application and 'to the touch' it doesn't have a sticky, slimy residue on your hands like Cowboy Magic can. Found this gem at a horse show nearly ten years ago. Have never used another product since! We have heavily feathered Cobs. Spray on, brush glides through with ease. Now we fight over who gets to do the grooming! This is a good product. Detangler and helps remove dirt. Adds sheen too! Love this product! We use it to untangle mane and tail. Easy to use and leaves hair smooth and shiny. I use this everyday before brushing out my horses mane and tails! they both have really thick hair and this stuff works wonders! It smells absolutely amazing and makes their hair so shiny! I want to use it on my own hair lol Will be a forever customer! I use this on my Shepherd/healer dog. His coat gets matty and worse behind the ears where it gets in knots. This conditioner works great for that and the smell is nice too. would highly recommend this product. I love this stuff! My filly has a super thick mane and long tail. I can spray it on her wet hair and the next day when I get her out, the brush just glides thru. Her hair is also silky and smells like Piña Colada. 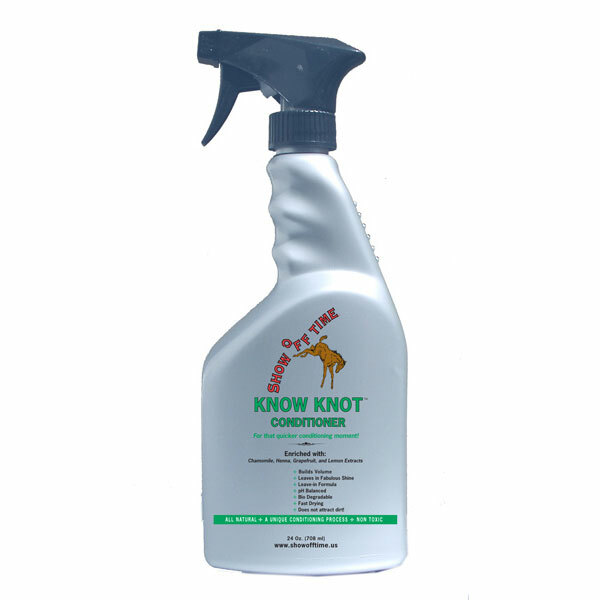 I used to groom in some big barns when I was younger and unlike some of the other products out there, Know Knot doesn't dry out the hair with extensive use. Great product!